STA has Art! It’s here for your enjoyment, reflection, and prayer. When the Gathering Space was designed, the large white wall presented an unexpected opportunity for STA to tell our story. Parishioners, old and young, stated what STA meant to them –welcome, sharing a meal at the table, forgiveness, coffee and donuts, music, and more. Jo Myers-Walker, artist and parishioner, organized those ideas into vignettes, sculpted from clay. They may remind you of passages from scripture. On the wall to the left, a fact sheet will help you with suggested scripture references. You might focus on one of the vignettes, reflect on what you see that reminds you of STA. When a parishioner dies, we often place the coffin or urn by the Story Wall during funeral vigils to emphasize his or her connection to STA and its story. 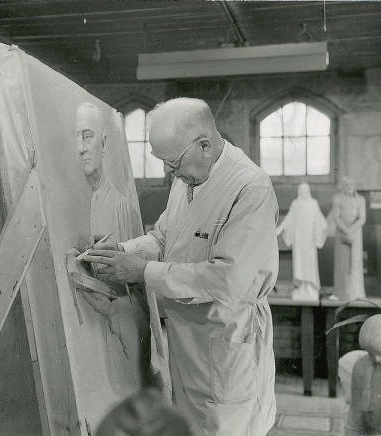 Did you know that STA has 3 artworks by Christian Petersen (1885 - 1961), a nationally known sculptor, who was ISU’s sculptor-in- residence from 1934-1955? During that time he taught and completed 12 major sculptures for ISU including “Fountain of the Four Seasons” in front of the Memorial Union and “The Marriage Ring” outside MacKay Hall, and numerous smaller artworks. 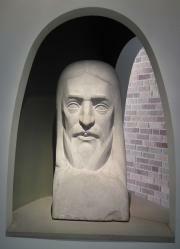 During the last 18 years of his life, he created many sculptures with religious themes. You may have seen “Madonna of the Schools”, a grouping of 3 school children with the Madonna and Child that he made for St. Cecilia in 1946. He attended mass at St. Cecilia with his wife Charlotte for many years before converting to Catholicism in 1949. Sometime after his death, Charlotte became a beloved parishioner at STA. 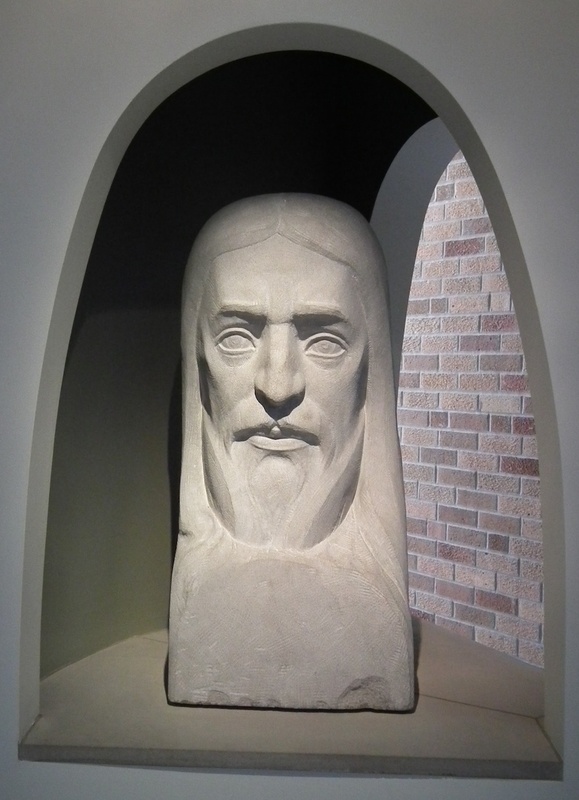 Head of Christ, in its niche outside the Reconciliation Chapel, is a quiet presence in our Gathering Space. Initially it was placed high up on our west wall where it was hard to see the expression. Now at eye level, you can see the simple, but strong lines Petersen used to portray Christ’s face. Look especially at his deep-set eyes. When you are preparing for Reconciliation do you feel the warmth of forgiveness in his gaze? It was carved from Bedford (Indiana) limestone in 1950. It was a gift to STA from Lila Mae Hunsley (formerly Sr. Eleanor) who purchased it from her friend Charlotte. Head of Christ in the Student Center has a special story. It was sculpted in clay by Petersen as a demonstration during a Newman Club meeting at STA around 1951. A quiet man, he let his hands and Charlotte do the talking. Notice the details of the face, especially the eyes and hair. Is that a hint of a crown of thorns on his head? Imagine, this was just a quick study! Normally when Petersen did a demonstration, he took the clay with him to reuse. But this time, he left the artwork with STA. It dried naturally, but has never been fired. Christ with Bound Hands stands on a shelf just outside the main office in the Student Center. You see Christ standing before Pilate, a muscular figure with an intense facial expression. How do we interpret that expression? Petersen wrote that he “tried to depict the timeless King judging His judges.”* Is he judging them with contempt – or mercy? 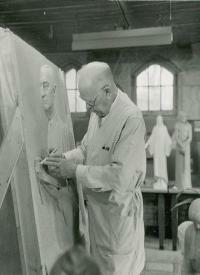 Petersen made the original 39 inch plaster sculpture in 1950 for Archbishop Rohlman who presided at the ceremony when Petersen became Catholic. 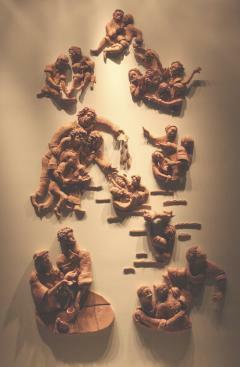 A number of reproductions were cast from a smaller version and sold as a fund-raiser at STA in the late 1950s. Ours once belonged to Fr. Ev Hemann and was given to STA at his death. * DeLong, Lea Rosson, Christian Petersen, Sculptor, Ames, IA: Iowa State University Press, 2000, 104. STA has a beautiful icon of Mary and the Christ Child because parishioners asked for an image of Mary when the renovation and expansion of STA was in the planning stage in the early 1990s. We decided to commission an icon of Mary – it’s an old art form, but looks at home in our contemporary space. It’s a style of painting portraying sacred figures that became an important part of the Orthodox Church. Sometimes described as “a window to the holy”, it provides a focus for prayer and thought. The image is stylized rather than realistic. An icon painted today in the traditional manner is based on an earlier icon’s design, uses specific methods and materials including egg tempera paint and gold leaf, and involves prayer by the artist. cheek and embraces her. Mary seems pensive Is she thinking about her responsibility as a young mother? Is she in awe of her role as Mother of God? Is she looking ahead to her son’s death on the cross? The artist of our icon was Yaroslava Surmach Mills. John Donaghy helped us locate her in Nyack, NY after we admired his notecard reproductions of some of her icons. Before the days of email, we communicated with her via phone and letters, never meeting her in person until she came to STA in Fall 2000 to give a talk about her work, several months after her icon arrived at STA. Our icon was funded through the generosity of Rita and Phillip Baumel. Back in the southeast Devotional Niche stands a sculpture of our patron saint and theologian St. Thomas Aquinas. How do we know it is St. Thomas? For one thing, he’s big – 6’ 5” tall. He’s wearing the traditional Dominican clothing and hair style. There’s a sun-shaped medallion on his cloak representing his holy teachings. And he holds a scroll and is surrounded by his books – which he is ready to share with you. His students called him the Dumb Ox, because he was a large man who didn’t talk a lot. But when he spoke or wrote, it was worth paying attention. His scholarly writings gained him the title of Doctor of the Church. The artists: Jerzey Kenar, Polish artist now living in Chicago, carved our St. Thomas Aquinas from a large block of basswood. Many pieces of this light-colored, soft wood were joined together to form the block. Notice the smooth face and hands, in contrast to the rough texture of the habit. He also constructed the wood library, table, and bench. Marian Slota, Jerzey’s classmate from art school days in Poland, created the background of drawings representing Romanesque architecture of the 13th century. An invitation to you: The 13th century St. Thomas Aquinas is presenting a book to the 21st century visitor –maybe you. Often you’ll see on the table cards with one of his prayers. So, pull out the bench and sit for a while. Two generous STA benefactors funded the St. Thomas Aquinas Devotional Niche. The concept for our Great Cross included plans for 2 or 3 processional crosses for different liturgical seasons and celebrations. 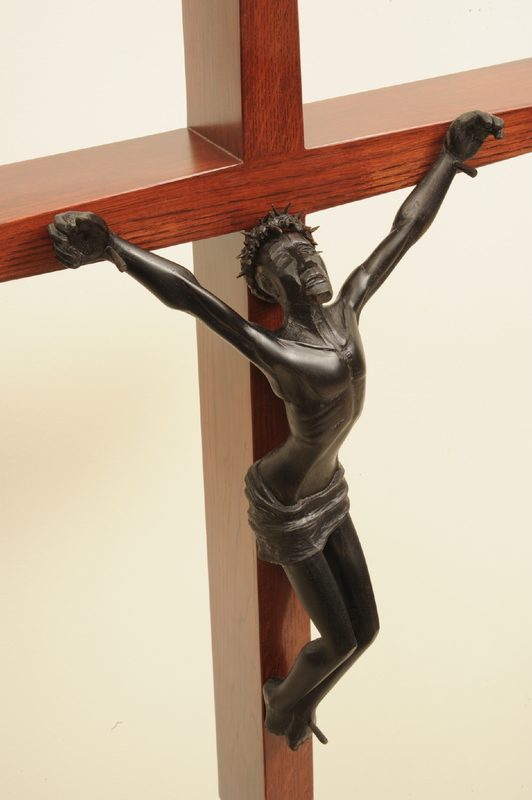 One would be a processional crucifix, but what kind would be most meaningful for STA – should it portray Christ’s suffering, death, or resurrection? Why is it a suffering Christ? Look at the nails in his wrists. Why the wrists rather than his hands? We studied the excruciating process of crucifixion and learned that nails needed to be in the wrist in order to support the body. For insight on the Cross of Christ read the words of 9th century Theodore of Studios contained in our crucifix prayer card designed by parishioner Mike Lanning. Cards are in the Gathering Space, above the “sign up” table and on the book rack. The artist: Jeremy Rudd, ISU College of Design grad with an MFA from U. of Massachusetts, created the processional crucifix. He carved the corpus from walnut, ebonized to produce the lustrous black color. The cross is white oak stained to match the purple heart of the Great Cross. In addition to his art career, Jeremy teaches at Divine Word College in Epworth, IA. The children of Frank and Slava Orazem funded the processional crucifix in their parents’ memory. They were STA parishioners. That’s the large sculpture – 2 figures and a cross – on the wall at the corner of Lincoln Way and Ash Ave.
What’s the message? As you ponder “Gathered in the Spirit”, what comes to mind? People seeking relief from heavy burdens? Forgiveness? Sharing with the poor? Mary and John at the foot of the cross? “Where 2 or 3 are gathered in my name, there am I in their midst”? There are many possible responses. We talked with the artist about qualities parishioners identified as important at STA – welcome, hospitality, and service to others. We requested an artwork that represents our faith and how God is reflected in the people of STA, a place where we can be both server and served. The result was 2 figures interacting with emotion with the cross. The artist planned 2 different viewing experiences. During the day, walkers on the sidewalk nearby can appreciate the emotion in the faces. At night, lighting makes the total image very clear from a distance. She selected blue for the figures to represent reverence and to mirror the Iowa sky on a beautiful day. How did it get on the wall? Carefully! Quality Manufacturing of Des Moines, the artwork’s fabricator, planned the challenging installation of the 15 ‘ tall, 1700 pound stainless steel sculpture. A crane did the heavy lifting while 2 men on lifts guided the sculpture toward the wall. Once there, it was gentlylowered into its housing. At the final “thunk”, color returned to the engineer’s face, the artist smiled, and we all cheered. Artist: Rebecca Eckstrand, Des Moines artist, studied at the American Academy of Art in Chicago and Sir John Cass School of Fine Arts in London. She has artworks in Des Moines, Iowa City, and ISU. Her most recent ISU commission is a series of 4 glass mosaics surrounding water fountains in Hach Hall. Rita and Phillip Baumel were the generous donors. 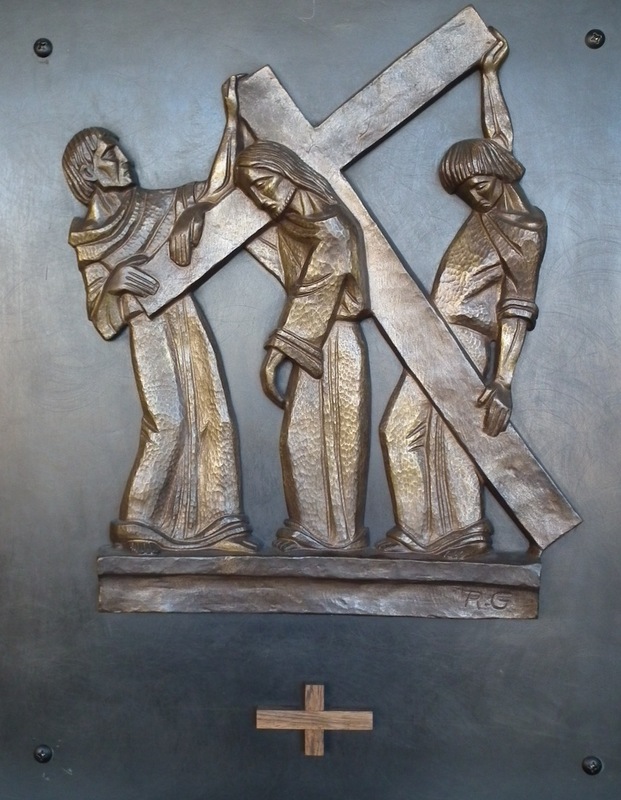 Do you glance at our Stations of the Cross as you hasten along the upper pathway to mass? We pay attention to the Stations during Lent, but maybe not so much the rest of the year. When they were installed in 1964, the Stations were placed high up on the walls of the church, too high and too dark for us to see the details. During the renovation and expansion completed in 2000, the Stations were moved to the current location where they are lower and well-lighted, the better for us to follow the path of Christ’s crucifixion. When you are in the upper pathway, stop to study one or more of the Stations. Look at the beaten and exhausted Christ falling to the ground under the weight of the cross. Note the strength and force of the men nailing Christ to the cross. See the grief-stricken face of Mary looking up at her Son dead on the cross while John seems overcome with emotion. Will this make walking the way of the cross more meaningful to you? Those of us who were around in the 60s recognize the style of the Stations as very much of the 60s. Religious art of that time, including banners and illustrations, often used this simplified style, incorporating just the essential details. But the art form has older roots. In medieval times, some churches had huge wooden doors and later bronze doors divided into panels of low reliefs illustrating scripture stories. It also harkens back to stylized woodcut designs made through the ages in many cultures. The artist: R. Gourdon created the bronze Stations in the early 1960s. It appears that he designed very similar Stations in different sizes and then made limited castings of each set. Through the marvel of the internet, I found his Stations in a church in Ireland and another in England. Where is he? Look for a low-relief of St. Jude in the balcony overlooking the Gathering Space. It’s a good place to study or pray. Why St. Jude at STA? It’s quite a story! The short version: A 1955 ISU grad faced a dilemma – what career path should he choose? So he prayed to St. Jude, considered the patron saint for difficult and desperate cases. He felt St. Jude’s guidance as he chose the stock brokerage business. In the 1970s he and Fr. Supple, our founding pastor, developed a plan to honor St. Jude at STA. 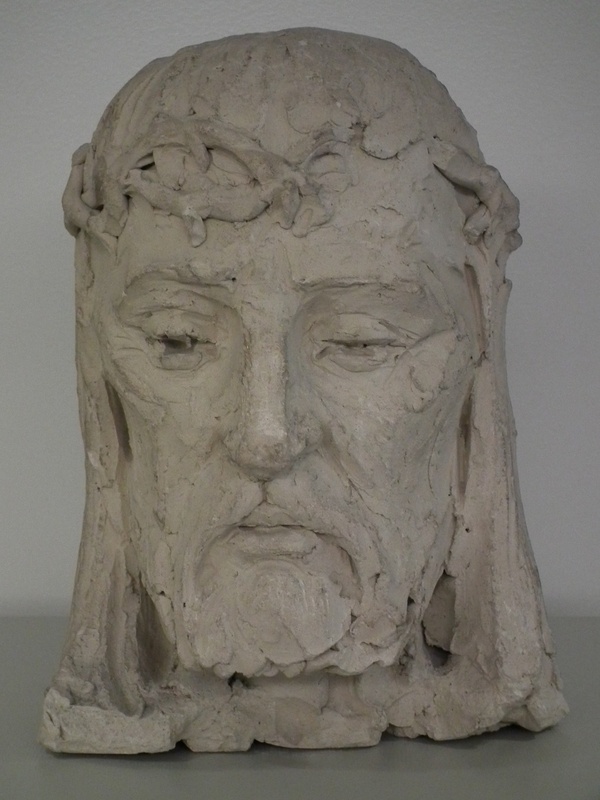 The result was a low-relief clay rendering of St. Jude and a scholarship fund that continues to grant scholarships to STA students each year. Legends and traditions abound concerning St. Jude. Artist Peter Lupori used some of those to determine the symbols and design for the artwork. A staff represents St. Jude’s authority as an apostle – and his walking from place to place. The leaves on the staff indicate the relationship between Christ and his disciples, “I am the true vine…you are the branches…” (John 15:1a, 5). The weapon with an ax head at his feet foretells his martyrdom. There is a host on the book he is carrying and a smaller host on his throat showing Christ’s central place within St. Jude. See the lines of a cross centered on the larger host – he has taken up the cross to follow Christ. The artist: Peter Lupori, nationally known artist, was teaching at the College of St. Catherine in St. Paul when he created our St. Jude in 1977. The artist's vision is for a crucifix that can be seen from a distance, that will center the attention of parishioners upon Christ's saving death and resurrection and on the Eucharist, and will unify the community. For the past 500 years, the crucifix has usually included Christ dead on the cross. However, the history of both the Eastern and Western Churches contains examples from the 10th century onwards of crucifixes with Christ gazing directly at the people. The practice was common in the middle ages. The design for the STA crucifix is not a risen Christ (which shows Christ post-Resurrection). This crucifix shows Christ just prior to his death. By his open gaze, we encounter the mystery of his suffering and saving death. We also are invited into relationship with him, as well as to contemplate him and what he means to us as the foundation and wellspring of our faith. The crucifix consists of a single panel in the style of a Byzantine cross, with rectangles at the ends of the width and length. The rectangles at either end of the horizontal beam include icons of the Mother of God and St. John. Inscriptions are on the top rectangle. The rocky mountain with the cave and skull are found on the bottom rectangle. This design is peaceful, prayerful, profound, and somewhat more contemplative than the other design. 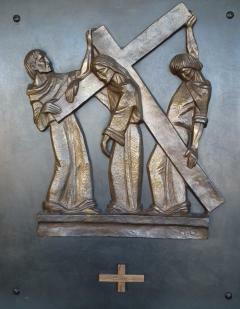 The figures in the rectangles are partial and not very large, yet they do maintain the community aspect of the crucifix. What makes this crucifix truly unique is that the same image appears on the front and back of the 7’6” icon, suspended above the altar, so that the worshipping community remains one body. Artist: Kathy Sievers, iconographer, St. Elizabeth the Wonderworker Iconography Studio. We are grateful to Phil Baumel and his family for the donation of the creation of this crucifix, and it is dedicated in memory of Rita Baumel. We also are grateful to the family of Leo and Sue Peters who donated the development and installation of this art. in communion with St Thomas Aquinas Parish, December 2017.